Crack open a few cold ones at an indoor and outdoor bar serving local beers, cocktails, and wine at Kirby Ice House. Located in the heart of Upper Kirby near Richmond Avenue and Eastside Street, this neighborhood haunt is beloved for its expansive bar, big backyard, and food trucks accessibility. Easily accessible from Greenway Plaza, River Oaks, Medical Center, Downtown, and the Galleria area, Kirby Ice House offers more than 50 beers on tap, a diverse wine selection, high-end bourbon and whiskeys, and plenty of homemade craft cocktails. Looking to day drink outdoors? 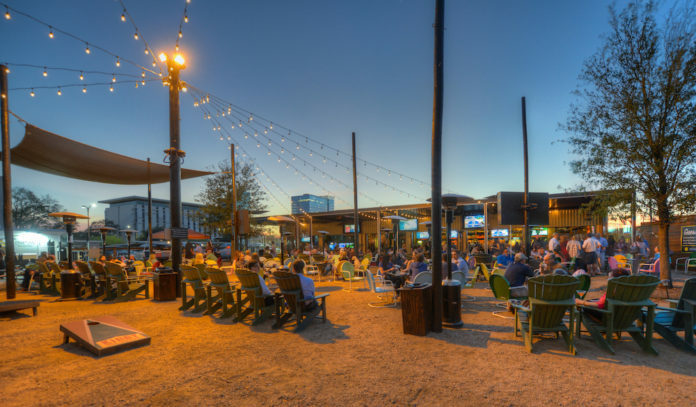 The bar offers a 1-acre backyard that is great for large groups and not to mention, dog-friendly, too. And if you’re looking to stay indoors, the bar has a huge inside seating area including 75 bar seats, a comfy sofa lounge area, a hi-def TV and more. Hours: Monday to Friday 2pm to 2am; Saturday 11am to 2am; Sunday noon to 2am.